Off Centre, an exhibition by Nic Sandiland, celebrates the overlooked pedestrian choreography of everyday life. The circus may appear to be full of illusion and magic, but its poetic spectacle is deeply rooted in reality. Those death defying feats of human skill are only electric because they are real. The performers seem to transcend the limits of what is possible; kinaesthetically we empathise with their peril and are drawn into their world. Nic Sandiland’s movement based works elevate the mundane and often overlooked choreography of daily life. He is interested in the everyday motion of the viewer in a choreographic context and explores pedestrian movement through a cinematic environment. The three works featured in this exhibition create an intimate bridge between the viewer and the digital performer. Trip Hazard — part one-liner gag, part public intervention — presents the transfer of momentum between a physical environment and a digital space, with potentially catastrophic consequences. 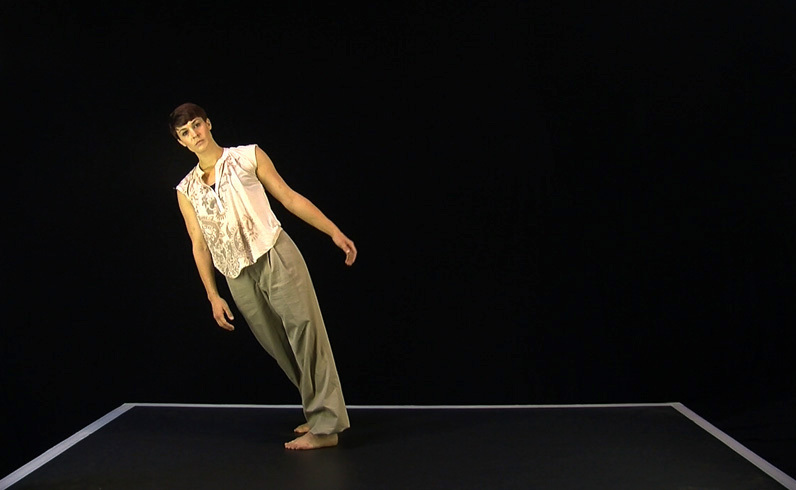 Gravity Shift looks at how we might perceive gravity through connecting with another body in motion; it aims to decentre the viewer’s physical awareness by presenting a dancer whose movement is effected by a dynamic, distorted pull of gravity. Finally, Exosphere. As with the most memorable performances, Sandiland’s work short-circuits people’s expectations. Be it the impact their motion has through space, or the fabric of reality. He unlocks unexpected shared experiences and transforms the everyday into a mesmerising experience.